Motherwell went down to their fourth straight Scottish Premiership defeat in a narrow 1-0 reverse at Kilmarnock on Saturday. Yet the Steelmen - who had lost their previous three league matches to Celtic, Hearts and Partick Thistle, started positively on a fine, crisp winter afternoon in Ayrshire. And they were well in this match throughout, creating several chances but being made to suffer from a lack of potency in front of goal. Away forward Ryan Bowman looked lively early on and had a second minute shot deflected wide. And the visitors spurned a great opportunity to break the deadlock on 12 minutes when a terrific cross by Burundian midfielder Gael Bigirimana - restored to the starting line-up - found Craig Tanner whose close range shot was stopped by Killie keeper Jamie MacDonald. The hosts responded positively and Chris Burke's whipped cross from the right went across the goalmouth before just missing the far post. Killie's Eamonn Brophy was then involved twice in quick succession, firstly producing a fine run and shot from outside the box which was blocked by 'Well skipper Carl McHugh. Brophy headed another Burke cross from the right well over on 23 minutes, as 'Well's rearguard made a much more accomplished start than the first half nightmare in midweek which had seen them 3-0 down to bottom club Partick Thistle at half-time. And Motherwell - backed continuously by a lively drummer in the away fans' section - produced a brilliant 39th minute move which started with Bowman's backheel to Tait, whose cross was met by Alex Fisher who failed to beat MacDonald. It was a great chance for the striker and the Steelmen paid for that miss just two minutes later when Burke's corner caused panic in the Motherwell penalty area, goalkeeper Russell Griffiths failed to deal with it and Killie's Scott Boyd scrambled the ball in. Motherwell, playing their first match since news broke of top scorer Louis Moult's imminent £450,000 transfer to Preston North End, might have equalised virtually straight away but Fisher volleyed well wide from a Bowman knockdown. Motherwell midfielder Liam Grimshaw sustained an early second half injury and was replaced by Andy Rose, before the luckless Fisher had a snap shot well saved by MacDonald. Rose's weak header was saved by the impressive MacDonald as 'Well bossed the second period. Killie - looking better under recently appointed manager Steve Clarke - hit back with a wicked Burke cross being just missed by Kris Boyd in the centre. Bigirimana had an impressive match for the Steelmen, with one fine turn past two men earning the first of a succession of corners which Motherwell were unable to convert into goals. Fisher headed a Bigirimana corner wide, before a frustrating afternoon for the ex-Inverness Caley forward was ended when he was replaced by George Newall. Despite 'Well's superiority, Kilmarnock came extremely close to establishing a two-goal cushion after 66 minutes. 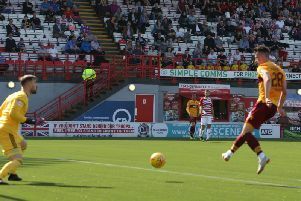 A shot by substitute Jordan Jones took a deflection off Cedric Kipre and appeared to be heading for the net before Motherwell scrambled clear. Man-of-the-match Bigirimana then sent in a wonderful inswinging cross which found no takers, the latest in a long line of chances which may very well have had 'Well followers pontificating what might had happened had Moult been on the park. Newall fizzed a low shot well wide for the Steelmen before play steamed to the other end and Boyd's shot was blocked by Kipre. McHugh was booked for fouling Boyd on the edge of the box, before the ex-Rangers forward's effort from the resultant free-kick was sent straight into the defensive wall. Substitute Ross MacLean headed miles off target for the Lanarkshire side and the regulation 90 minutes had just been played when Greg Kiltie was put clean through on Griffiths at the other end but the former Everton custodian saved. Motherwell couldn't equalise in the remaining minutes and slip into the bottom half of the table for the first time since August. Motherwell: Griffiths, Tait, Hammell, Grimshaw (Rose 47), Bigirimana (MacLean 80), McHugh, Fisher , Bowman, Dunne, Kipre, Tanner.